I have been looking at various examples in ArcGIS, R's gstat and Python, but cannot seem to find a solution. In all solution, I can only vary the search radius based on the number of points found. In order or preference, I am looking for a solution in Python, R or ArcGIS. Any help? As far as I understand your question, I think you have to make two Inverse Distance Weighting interpolations: one using the small search radius for the high population density data and the other with a big search radius using the low population density data. I give you a reproducible example in R using the data("meuse"). Almost all the code is commented for help and guidance. 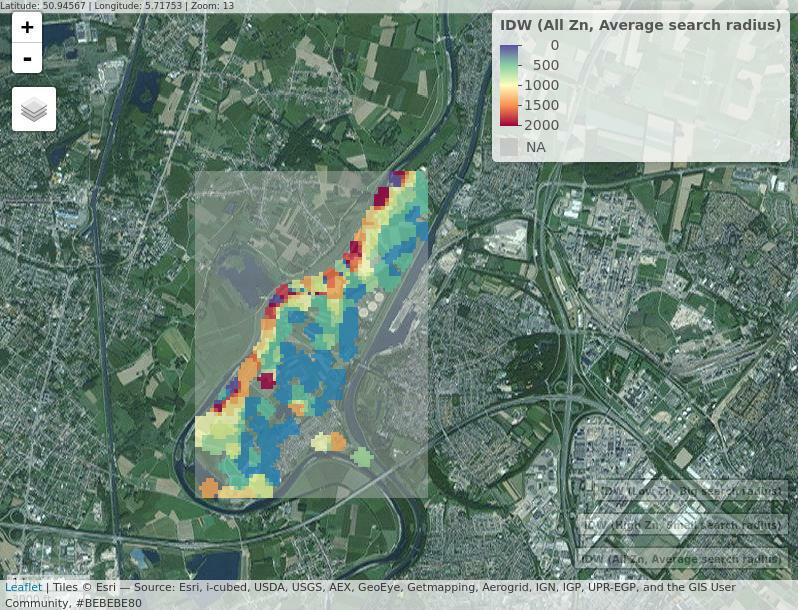 You will find three IDW examples: 1. all the data, 2. high values of Zinc with small search radius and 3. low values of Zinc with big search radius. Note 1: in R using the function idw() from the package gstat you can vary the search radius with the maxdist option. Not the answer you're looking for? Browse other questions tagged arcgis-desktop python r kriging inverse-distance-weighted or ask your own question. Creating georeferenced random data in Python/R? SAGA Inverse Distance Weighting in QGIS - How to Set Minimum Number of Points?